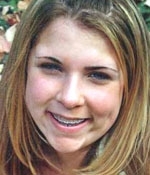 MAY 15--Federal prosecutors today are expected to announce criminal charges in the "cyber-bullying" case involving Megan Meier, the 13-year-old Missouri girl who committed suicide following a heartless online hoax engineered by the mother of one of her friends. FBI and Department of Justice officials have scheduled an 11:30 AM press conference in Los Angeles to detail an anticipated indictment in the Meier case. The Missouri teenager became despondent after a boy she met via MySpace viciously turned on her, accusing the girl of promiscuity. The boy also wrote that the world would be better off without her. Meier hanged herself in a closet in her home in November 2006. A subsequent probe by the St. Charles County Sheriff's Department determined that Megan's online friend "Josh Evans" was, in fact, the creation of a local family seeking to determine whether Megan was saying derogatory things about their daughter. The adult behind the MySpace ruse--and the apparent target of federal probers--was Lori Drew, whose daughter had been friends with Megan, who is pictured at right. On these pages you'll find the original sheriff's report on the case and the incident report on the teenager's suicide. Following Megan's death, Drew, 49, and her husband Curt sent the Meiers a handwritten note saying they had "every compassion" for the Meier family and asked for a chance to talk to them. Tina Meier, Megan's mother, told TSG today that she did not testify before the L.A. grand jury probing the hoax, though she was interviewed in St. Louis by Mark Krause, the federal prosecutor heading the investigation.